Well, we have a new winner for the longest wine name to be reviewed here! The 2007 Wyndham Estate George Wyndham Founder's Reserve Langhorne Creek Shiraz! Wooo, that takes awhile to say (and type). A quick refresher for the wine newbies. Shiraz is the exact same grape as Syrah. I know, it sounds crazy, but it's true. The difference in name comes mainly from where they are grown. Shiraz is Australian grown, whereas Syrah is French grown (although this grape varietal is now being grown in California and other places). Even though they're the same grape, the flavors do vary greatly due to growing location (imagine that). Shiraz tends to be heavier, full-bodied jammy wines, while Syrah is typically lighter, peppery, and more acidic. Same grape, different taste. Understanding the difference in flavor profiles due to growing location, you can then figure out what to expect from bottles of Shiraz and Syrah grown in California and elsewhere. Anyway, back to this bottle of wine. Wynham Estate was the first commercial Shiraz vineyard in Australia, and it shows in the quality of their wine. This bottle uses grapes from the Langhorne Creek vineyards which were aged in French and American oak barrels for 15 months. 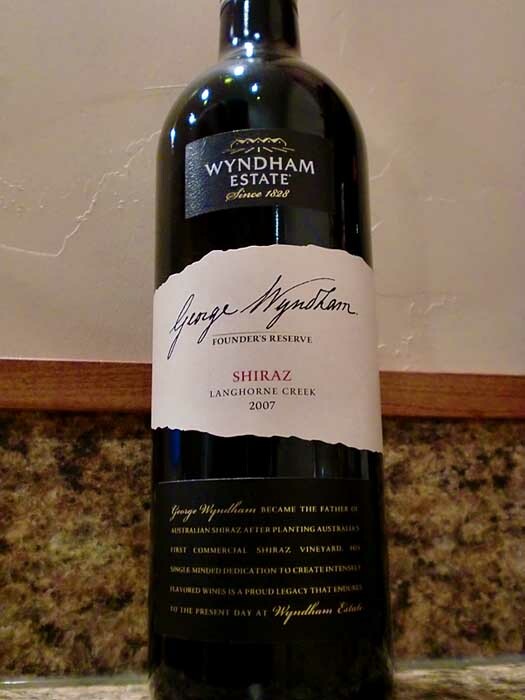 The 2007 Wyndham Estate George Wyndham Founder's Reserve Langhorne Creek Shiraz pours a deep, black cherry color that verges on becoming purple. It smells of ripe plums, red currants, and has a strong mint presence. On the palate, I get jammy black cherries, plums, and blackberries, powerful notes of menthol, with hints of chocolate, vanilla, and bits of spice in the finish. The tannins are moderately strong and chewy, very fitting for the style. While the overt minty quality of this Shiraz may turn off some people, I find it to play into the wine's complexity making it extremely interesting sip after sip. The Chief Winemaker, Nigel Dolan recommends having this alongside "scotch fillet with herb butter, succulent slow-roasted lamb shanks and braised beef cheek with seasonal vegetables." Personally, I say have it with any hunk of delicious lamb or beef you can find. A very tasty, complex wine. Drink This: if you're looking for a mint-forward, deliciously dark, jammy Shiraz. Don't Drink This: if you don't like minty notes in your red wine, because that's upfront and center here.